Totally Tilda - Tilda in Pink and Red for Valentines. A beautiful creation as always Kate! So many little details to take in! Thanks for playing at Crafting For All Seasons this time! So many beautiful embellishments! Truly a work of art. Good luck in The Corrosive Challenge this fortnight! What an absolutely gorgeous card kavi ..I so love the colors and the floral arrangement on this and ofcourse your coloring of the cute tilda is just perfect !! 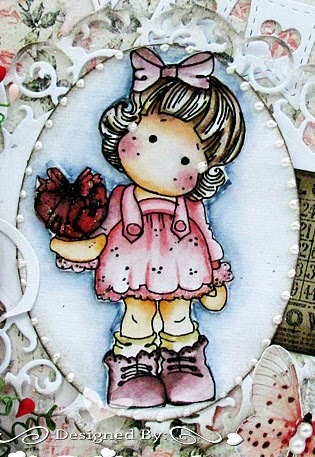 Beautiful card with this sweet Tilda, love it! Thanks for joining us @ Tilda's Town this week! What a beautiful card! Love your sweet Tilda, lovely banner & gorgeous flower cluster! Thanks for playing at 4 Crafty Chicks. 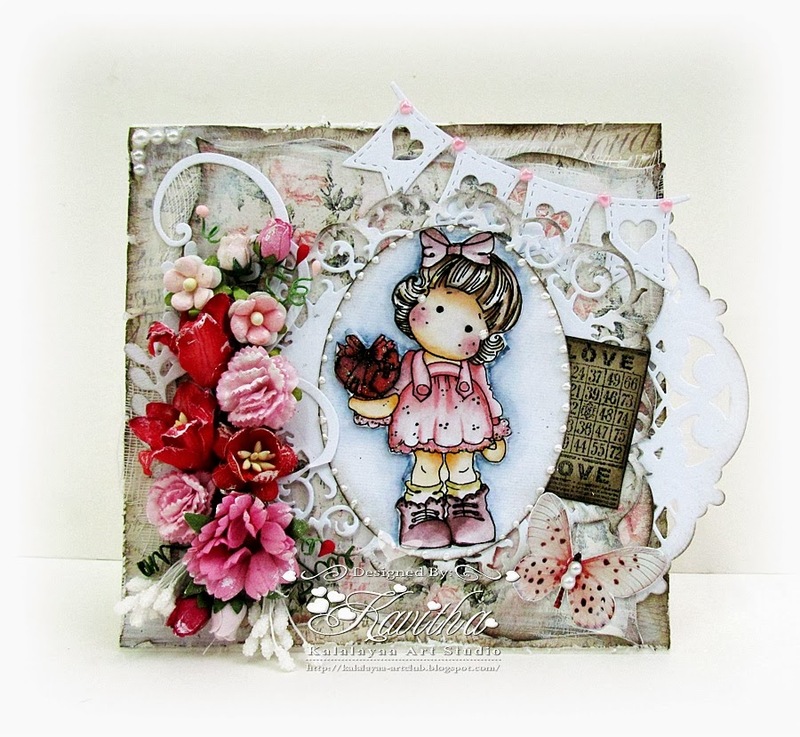 Gorgeous card, Tilda is beautifully coloured and I love all your pretty dies and flowers. Thank you for joining us over at Magnolia-licious. Good luck! Gorgeous card. Thank you for joining us at Divas by Designs this week. A beautifully coloured Tilda (and I love this image!) Your embellishments are amazing..so much to look at and all so pretty. This is such a beautiful card! I love how you've colored Tilda. She is perfect! I love all the embellies you've included. Everything works together so well! Thank you so much for entering your treasure into the Anything Goes Challenge at Magnolia-licious! Good luck to you! Really beautiful with so much gorgeous details. So pretty, I like the flowers the layout, the banner is awesome. I love that die. Great job with the colors and the image, she is super cute. Thanks for playing our Flags and or Banners Challenge at 4 Crafty Chicks! Wow! This is GORGEOUS!! Love your coloring and all the details! Thank you so much for playing along with us at Crafty Sentiments Designs! We hope to see you play along again soon! Stunning card - amazing colouring and beautiful embellies. Your card is stunning. I love all the details. I kept looking and seeing more and more. I love it. Thanks for joining us at Aud Sentiments. Gorgeous. Your card is stunning. Love the layout. Thanks for playing along at That Craft Place. Gorgeous card. Thank you for sharing it with us at Midweek Magnolias. Lovely Card. Like all the FLowers. so sweet. I love this sweet Tilda image..stunning flowers gorgeous design. Thanks for sharing at In The Pink chall this time. Świetna kartka. Taka kolorowa i ciepła.